FREEDOM, Calif., April 4, 2016— At a time where conflicts around the globe threaten stability and human health, Six Seconds issued its bi-annual “State of the Heart” report showing trends in emotional intelligence worldwide. Using a sample from over 100,000 emotional intelligence assessments taken by people in 127 countries, Six Seconds, the world’s largest and oldest emotional intelligence nonprofit, released a report on April 4th detailing the results. 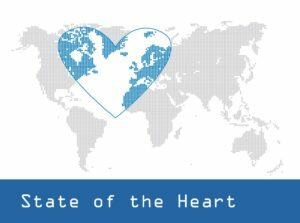 The “State of the Heart“ report looks at emotional intelligence in 8 different sectors, from hospitality to IT to industry, and identifies key talents of high performers in each sector. The sectors with the highest emotional intelligence are logistics/transportation, education and healthcare. It also compared aggregate emotional intelligence scores across three regions in the world, Europe/Middle East/Africa, the Americas, and Asia/Australia/Oceania. Interestingly, the global regions are highly complimentary, for example, the top talents in Asia are the lowest in the Americas. The report also reveals some important differences in emotional intelligence between genders. For example, in all three regions, men have stronger scores than women in the area of problem solving, whereas women have stronger skills in the area of prioritizing and reflection. These competencies are highly related to civil behavior. With less emotional balance and less compassion for others, people are more volatile and more likely to behave in destructive ways. With less internal motivation, people are more passive. While scores dropped around the globe, the region with the biggest decline in these skills is the Americas. Meanwhile, emotional intelligence scores are closely correlated with performance, with 55% of the variation in four key success factors predicted by EQ: Effectiveness, Wellbeing, Relationships, and Quality of Life. In fact, those who scored above-average on EQ are 43 times as likely to score in the high performance zone on those outcomes. “The bad news is emotional intelligence continues to decline globally, in a time when these skills are urgently needed to increase peace and solve complex problems like the environment. I hypothesize this is due to growing stress and chaos in the world — maybe that’s also why the analysis found that emotional intelligence is essential for top performance,” said Six Seconds’ CEO Joshua Freedman. The State of the Heart analysis is part of Six Seconds’ work to research and disseminate data that will help increase emotional intelligence (abbreviated “EQ” for “Emotional Quotient,” similar to the abbreviation “IQ” used to measure cognitive intelligence). The research was conducted using the EQ assessment tool, SEI. SEI is a well-validated, highly effective tool. It puts scientifically sound, learnable, measurable skills of emotional intelligence into a framework so people can apply EQ at work, school, and life.